On saving it, your environment will be renamed. If you want to delete an existing environment, all you need to do is to click on ‘Delete this environment’ on the Details page and mention the name of the environment, to make sure you are not deleting it by mistake. 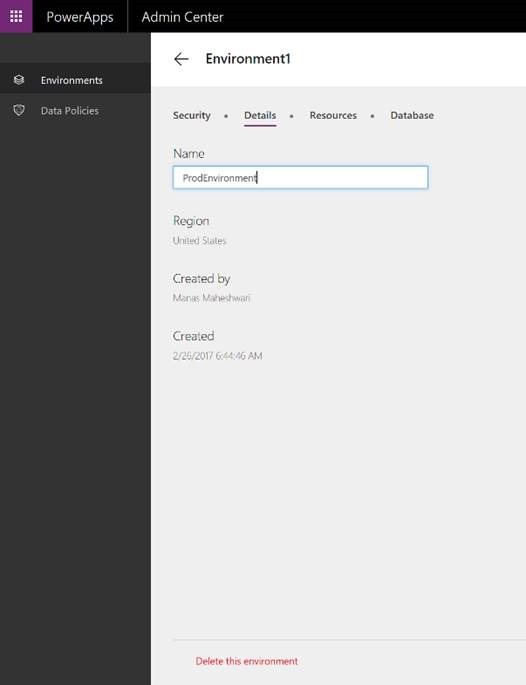 Deleting an environment will delete all the resources in the environment like PowerApps, database, connections, etc. including the roles and permissions related to environment and resources. Please note that you must delete all the flows in the environment before deleting the environment. Anyone who is an environment admin or organization’s global admin (tenant admin) can rename or delete an environment. Also, default environment in an organization can’t be deleted. In case you delete an environment by mistake, you can request for restoring the data by contacting support within seven days of deleting the environment. Also, note that only apps, database, connections, and custom APIs can be restored. Flows can not be restored as of now. It may be a good practice to export the apps, data, etc. to a secure location, if these assets are going to be important for your organization in future. See our blog post on migration for help with exporting the resources. Global admins can now access PowerApps admin center and can create global Data Loss Prevention policies for the tenant without needing any PowerApps plans. You can learn more about Data Loss Prevention policies. You will still need PowerApps Plan 2 to take advantage of administrating environments. Watch out for more updates coming to Admin center. Also, we want to hear your organization’s IT requirements to make you more successful in using PowerApps.